Find artworks, auction results, sale prices and pictures of Domenikos Theotokopoulos El Greco at auctions worldwide. Doménikos Theotokópoulos, called El Greco (Crete 1541-1614 Toledo) Saint Francis and Brother Leo in Meditation signed (?) 'doménikos theotokópolos e'poíei' (in cursive Greek, lower right, on the cartellino) oil on canvas 43 ¼ x 25 3/8 in. (110 x 64.5 cm.) El Greco\’s Saint Francis and Brother Leo in Meditation is one of the artist\’s greatest and most celebrated compositions, known in several versions and copies. With its dazzling and spontaneous brushwork and richly-worked paint surface, the present canvas is among the finest and best preserved examples of the subject, a mature work by this seminal Spanish painter of a sort rarely found in today\’s market. El Greco was born around 1541 in Crete, then a Venetian territory. After training there as an icon painter in the Byzantine tradition, he moved to Venice, where he became a disciple of Titian and an avid student of Veronese, Jacopo Bassano and especially the Mannerist art of Tintoretto, whose expressive treatment of subjects was to have a lasting impact. Rejecting the archaic conventions of Byzantine art, El Greco quickly mastered key aspects of Venetian Renaissance painting, including the Venetian predilection for glowing colour and bravura brushwork. After a sojourn in Rome, El Greco travelled to Spain, settling in Toledo in 1577. There he created some of his greatest visionary masterpieces, such as the celebrated View of Toledo (New York, Metropolitan Museum of Art), and the monumental Burial of Count Orgaz, still preserved in Santo Tomé, the church in Toledo for which it was originally commissioned. Like these paintings, Saint Francis and Brother Leo in Meditation has the arresting power of a hallucinatory vision, in which elements inspired by Italian Mannerist art - elongated figures, irrational space, flashing, supernatural light and surreal colour - powerfully evoke the spiritual realm. Although El Greco died in 1614 - after Caravaggio had ushered in the new naturalism of the early Baroque – his art is fundamentally tied to the precepts of Mannerism, with its reliance on the artist\’s imagination rather than the world of visible reality. It was El Greco\’s antinaturalistic palette and the emotionally resonant distortions of his figures that so profoundly influenced modernist masters such as Manet (fig.1), Delacroix, Van Gogh, Cezanne, Picasso and Schiele (fig.2), all of whom copied or quoted El Greco\’s works in an effort to understand his uniquely expressive power. The profound humanity of St. Francis – a rich merchant\’s son who renounced worldly possessions and founded a Catholic order that venerated poverty and believed that Nature itself was the mirror of God – held a particular appeal in the age of the Counter-Reformation, and by the time El Greco settled in Toledo, the city had no fewer than seven Franciscan convents and three friaries, the most important of which was near the artist\’s house. He displayed his affinity for the saint in at least ten distinct compositions, in which he evolved a new iconography in accordance with the dictates of the Council of Trent. Francisco Pacheco, the distinguished painter and influential art theorist, who visited El Greco at his home in 1611, called him the greatest interpreter of Saint Francis of his time, a view that has never been disputed. In the present painting, El Greco refrains from depicting the saint at the moment of his stigmatisation, as he is most often portrayed. Instead, he shows Saint Francis with his faithful companion, Brother Leo, at the entrance to a cave on Mount La Verna, where, towards the end of his life, he retired for fasting and prayer. Intended to serve a devotional function to stimulate prayer and pious reflection, this painting reveals Saint Francis musing over a skull, with Brother Leo kneeling in prayer by his side; it is of a type understandably, but misleadingly, known as the \‘Hamlet\’ Saint Francis, since Shakespeare\’s play, written in 1598-1602, was almost exactly contemporaneous. The stark simplicity of the composition and restrained palette emphasize the saint\’s asceticism and humility, while the placement of the skull in the centre of the foreground provides a focus for the viewer\’s own spiritual devotions. Saint Francis and Brother Leo in Meditation is El Greco\’s most celebrated depiction of the saint. Popularised in part by a reproductive print which El Greco commissioned in 1606, the composition is known in various versions, many of which were executed wholly or in part by studio assistants, or later imitators. The slightly larger composition of this popular subject in the National Gallery of Canada, Ottawa (fig. 3; 168.5 x 103 cm.) is generally considered to be the prime version and dated to the early 1600s. Prior to the 1996 London sale, the present picture had last been on the market in the mid-nineteenth century, and remained largely hidden from public view. Although some scholars suggested studio participation in its creation shortly before the 1996 sale, the picture was cleaned of much nineteenth century overpaint, and subsequently endorsed by Dr. William B. Jordan as the only autograph replica of the Ottawa canvas to have survived. The picture was acquired in the mid-nineteenth century by the Conde de Adanero, a Spanish collector with a legendary eye for quality who also owned the prime version of another of El Greco\’s compositions of Saint Francis in Meditation (showing the saint alone, in profile to the left) now in a private collection, Barcelona. Studio of Doménikos Theotokópoulos, called El Greco (Crete 1541-1614 Toledo) Christ in Benediction oil on canvas 14 3/8 x 10 5/8 in. (36.5 x 27 cm.) This small, expressive painting was likely part of a series, known as an Apostolate (Apostolado), which would have included twelve additional paintings of the Apostles. Following the tradition of the Byzantine icon paintings of El Greco’’’’’’’’s youth, the Savior is shown frontally, with his right hand raised in benediction and his left hand resting on a crystalline sphere representing Christ’’’’’’’’s dominion over the universe. The bold, energetic handling of paint as well as the juxtaposition of intense hues of brilliant whites and deep reds are characteristic of El Greco’’’’’’’’s late style, in which the artist used increasingly unblended brushstrokes to create an animated surface. Indeed, although none of the original commissions for El Greco’’’’’’’’s Apostolates are known, the series have all been dated by scholars to the final stage of the artist’’’’’’’’s career, between 1600 and his death in 1614 (see A.E. Pérez Sánchez, B.N. Prieto and R.A. Alonso, El Greco. Apostolados, exhibition catalogue, La Coruña, 2002, pp. 25 ff.). At this time, El Greco's work was very much in demand, and the artist often turned to his studio assistants to help him execute commissions. Consequently, the quality of individual paintings within a single Apostolate can vary, with some particularly strong works bearing El Greco’’’’’’’’s signature, while others are clearly based on the master’’’’’’’’s models but executed by another hand. The subject of Christ in Benediction, sometimes also called Christ the Redeemer or Salvator Mundi, is one of the most celebrated and recognizable compositions in El Greco’’’’’’’’s oeuvre, the most famous examples being the paintings from the two Apostolates in Toledo’’’’’’’’s Cathedral and Museo del Greco. The present work derives from the Christ in Benediction paintings from these series, but presents Christ bust-length rather than three-quarter length, and moves the position of the celestial globe from the lower center to the lower right of the canvas. Typologically, the Stillman Christ belongs to a group of Apostolate paintings by El Greco and his studio that includes the versions in the National Gallery of Scotland, Edinburgh; the Galleria Parmeggiani, Reggio Emilia; the Museo de Cáceres; and the Museo de Belles Artes, Oviedo. The last of these, from the Apostolado of the Marquis of San Feliz (see ibid., no. 19, pp. 271-72) is typologically closest to the present work, as they both present Christ with his head slightly turned to his left and, most notably, depict the Savior in a red tunic without the blue mantle that he normally wears in El Greco’’’’’’’’s paintings. The relatively small dimensions of the Stillman Christ are nearly identical to the known works from the Arteche Apostolate, including the Saint Luke and Saint James the Greater (each 36.5 x 26 cm.) sold at Christie’’’’’’’’s, Madrid, 5 October 2005, lots 4 and 5 (€1,199,200 and €997,600, respectively). The paintings from the Arteche series were probably still in El Greco’’’’’’’’s studio at the time of the artist’’’’’’’’s death, and were sold by Jorge Manuel to the Hospital Tavera in Toledo before 1624. They were then sold in 1631, most likely to Andrés Martínez Calvo, the Hospital’’’’’’’’s chaplain who, perhaps not coincidentally, had served as executor of the estate of the wife of Jorge Manuel, El Greco’’’’’’’’s son. By the early 20th century, the paintings were with the art dealer Sr. Arteche in Madrid, who broke up the series and sold them as individual pieces. Although several works from the Arteche series have been identified, the location of the Christ in Benediction remains unknown (see H.E. Wethey, El Greco and his School, II. Catalogue Raisonné, Princeton, 1962, p. 213-14). (Possibly) Miguel Lasso de la Vega y Madariaga (1783-1863), 10th Marqués de las Torres, and thence by descent to, Miguel Lasso de la Vega y Quintanilla (1830-1900), 12th Marqués de las Torres, and (probably) by descent to his son, José María de Ybarra y Menchacatorre (1880-1930), by whom (probably) bequeathed to his widow, Josefa Lasso de la Vega y Quintanilla (1884-1967), Condesa Viuda de Ybarra, Seville. Private collection, London. J. Camón Aznar, Dominico Greco, Madrid, 1950, II, p. 1367, no. 202. M.S. Soria, 'Greco's Italian Period', Arte veneta: Rivista di storia dell'arte, VIII, 1954, pp. 214 and 221, no. 64. H. Soehner, 'Greco in Spanien: Teil I: Grecos Stilentwicklung in Spanien', Münchner Jahrbuch der Bildenden Kunst, VIII, 1957, pp. 126 and 132, fig. 2. H. Soehner, 'Greco in Spanien: Teil III: Katalog der Gemälde Grecos, seines Ateliers und Seiner Nachfolge in Spanischem Besitz', Münchner Jahrbuch der Bildenden Kunst, IX-X, 1958-1959, p. 176, no. 3. H.E. Wethey, El Greco and His School, Princeton, 1962, II, p. 183, no. X79, as 'Follower of El Greco' but 'the best and presumably the earliest' of the three similar pictures of The Entombment, incorrectly described as 'tempera on panel'. J. Camón Aznar, Dominico Greco, Madrid, 1970, II, p. 1349, no. 214. 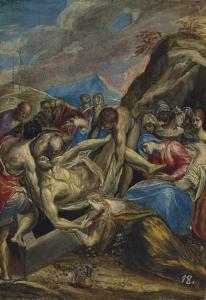 L. Steinberg, 'An El Greco 'Entombment' Eyed Awry\’\’\’\’, The Burlington Magazine, CXVI, no. 857, August 1974, pp. 474-475 and 477, fig. 90. N. Hadjinicolaou, ed., El Greco: Works in Spain, Rethymno, 1990, pp. 382 and 385 (reprinting Soehner, op. cit.). A.G. Xydis, 'El Greco's Iconographical Sources', in N. Hadjinicolaou, ed., El Greco of Crete: Proceedings of the International Symposium held on the occasion of the 450th anniversary of the artist's birth Iraklion, Crete, 1-5 September 1990, Iraklion, 1995, pp. 149-150 and 152-3, note 39, with an incorrect illustration. J. Álvarez Lopera, El Greco. La obra esencial, Madrid, 1993, no. 29. J. Álvarez Lopera, El Greco. Estudio Y Catálogo, II, 1, Madrid, 2005, no. 29, fig. 44. This remarkable panel executed on a small scale packs eighteen figures into a tightly compressed space with all the expressive grandeur and brilliant colorism for which El Greco is renowned, but on the reduced scale of a cabinet picture. In a tempestuous landscape with the three crosses on Golgotha visible at upper left, a vivid blue sky with swirling clouds and distant mountains are outlined in flaming reds and pinks. The crowd of protagonists (including St Joseph of Arimethea, immediately recognizable as a portrait of the aging Titian – El Greco's great influence during his seminal visit to Venice in 1568-1570) cluster around the body of Christ which is solicitously lowered into his tomb, while the Magdalene and Virgin Mary together with a group of female attendants grieve. The instruments of the passion – the nails and crown of thorns – are placed in the immediate foreground. A thick veil of discolored varnish mutes what is undoubtedly a rich, iridescent palette. El Greco is unusual in the breadth of the hugely varied cultures to which he was exposed. Trained as an icon painter in the Venetian colony of Crete, he never entirely abandons the Byzantine origins to which his simplified forms, flattened picture plane, brilliant colorism and emotional intensity bear witness. In Venice he responds to the rapidly painted expressive drama of Tintoretto and the high palette of Titian as well as to the nocturnes of Jacopo Bassano. When he moves to Rome in 1570 his artistic language is profoundly affected by the unavoidable presence of Michelangelo. Thereafter he moves to Spain, looking for the patronage of Philip II and although that proved to be a dead end, he remains there, working largely from Toledo, where his style resonates perfectly with the Counter-Reformation mystic fervor of Catholic late 16th-century Spain. He is claimed by art historians as the greatest genius of late Byzantine Crete, an artist steeped in the cultural and philosophic discoveries being made in Italy and as the father and soul of Spanish art. He is also hailed as a precursor of modernism, the forebear of Cezanne, Picasso and even Jackson Pollock. This panel has rarely been studied in person since it was first published by Aznar in 1950. This was rectified when it was examined and then published by Lopera and subsequently exhibited in Toledo in 2014. It belongs to a series of works depicting the Passion painted on a similar scale by El Greco notably a Pietà in the Hispanic Society, New York (fig. 1); another in the Johnson Collection, Philadelphia; and two other Entombments, one (now lost) formerly in the Palazzo Reale, Madrid and the second formerly with Giancarlo Baroni (fig. 2, sold Sotheby's, New York, 20 January 2013, lot 7). Another treatment of the same subject with additions giving it an arched format was in the Anstruther Collection (sold Christie's, 1965) and then the Marshall Collection (sold Bonham's, 28 March 1974). Based on 'an imprecise black and white photograph' Soener and Wethey rejected our panel which upon firsthand inspection has now been rehabilitated by Alvarez Lopera (see literature), Leo Steinberg and Fernando Marias among others. The general consensus is that it was painted in Rome, though Aznar, Hadjinacolau and Soehner (see literature above) all believe it to be painted shortly after his arrival in Spain. Our understanding of El Greco's Italian period has deepened, especially thanks to Lopera's recent work. Wethey had dismissed this entire group of early small-scale paintings as pastiches by another hand, perhaps an Italian workshop assistant, which ignored El Greco's evident references to what he was seeing in Italy. The debt to Michelangelo points to a Roman dating; Steinberg discusses this connection in a Burlington Shorter Notice (op. cit.) where he compares it to the dead Christ in Michelangelo's celebrated Bandini Madonna (fig. 3, now Museo dell' Opera del Duomo, Florence), then in Rome and also known through engravings by Cornelis Cort. Steinberg points to the rarity of such a direct quotation, writing: 'Such close replication is not normally found in El Greco…But in the Entombment, the whole of an alien figure, celebrated for unprecedented complexity and unmistakable, has been lifted, tilted and inserted intact. And so accurate is the transposition that one suspects the artist is not merely representing a Christ, but a Christ in quotation marks - 'Michelangelo's Christ.' El Greco is famous for his bold declaration that he could successfully repaint the Sistine Chapel, and it is entirely plausible to suggest that El Greco is, as Titian had done before, not just copying Michelangelo but competing with him. His figure of Christ is not merely a repetition of an instantly recognizable figure but an incorporation of it into a far more complex composition replete with all the expressive power of color and dramatic landscape which sculpture could not provide. Steinberg suggests that the prototype was painted in Rome, probably after El Greco saw the Pietà at Francesco Bandini's villa in Monte Cavallo, and that the other repetitions may have been painted in Spain. Of all the versions (and this differs in small details from the ex-Madrid and ex-Baroni versions), some known only from photographs, the present is of a superior quality and intensity of execution and should be regarded as the prototype. Marias writes of it, 'the London Entombment of Christ with the three crosses of Golgotha on the small hill on the left, and with the crown of thorns and basket on the left further away from the tomb, just under the arm of the Magdalene dressed in green rather than blue and yellow, is differentiated also by other stylistic features, from the finer drawing to the subtler light and color, and the different tones of tunics and cloaks, from the Ruiz Vernacci photo [ex-Madrid picture] and the other one or two panels'. Scholars now believe this panel to have been painted shortly after El Greco's arrival in Rome, c. 1571-2. The inclusion of a portrait of Titian combined with its subject matter has led others to suggest that it was conceived as an homage to Titian, who died of the plague in August 1576, which would make it a later Roman work. It is recorded that there were a number of small paintings by El Greco left in his studio at his death which were intended to be used as modelli for larger works. If this is one of them, and it does have a Spanish provenance, El Greco would have taken it with him when he left for Spain in 1577. Indeed, this painting has a distinguished 19th-century Spanish provenance, being said to come from the collection at the villa of Carmona of the 12th Marques de las Torres de la Pressa, Miguel Lasso de la Vega y Quintamilla (1830-1900). The 10th marquess (1783-1863) had in his collection 'a small picture of the Entombment of the Saviour, gilded frame, Flemish School, 200 reales' cited among the goods inherited by his second son, Miguel, which may, given the state of El Greco scholarship in 1863, well have been this picture. El Greco as Modernist Like a number of Old Master painters we most admire today, notably Caravaggio, Vermeer and Frans Hals, El Greco's current popularity is a relatively recent phenomenon. Among the earliest 'modern' artists to appreciate El Greco was Eugene Delacroix, who painted a version of a small Pietà (fig. 5) which relates to El Greco's Pietà in the Hispanic Society, New York. Not knowing anything about El Greco, Van Gogh painted an homage to Delacroix's homage to El Greco (fig. 6). El Greco's true 'rediscovery', however, perhaps begins in 1902 with the monographic exhibition devoted to him at the Prado. This was preceded by the recognition of his genius by Spanish artists Ignacio Zuloaga and Santiago Rusinol, who championed his work and arranged for the section of a monument in his honor on the promenade in Sitges in 1894. More importantly for the role of El Greco in the development of Modernism was Zulouga's purchase of The Opening of the Fifth Seal (fig. 7, Metropolitan Museum, New York) which the young Pablo Picasso saw in Zuloaga's studio in Paris in 1905 and which profoundly influenced the conception of Picasso's landmark painting the Desmoiselles d'Avignon (fig. 8, Museum of Modern Art, New York). In fact, Picasso had clearly taken note of his Spanish forebear's significance much earlier, as is evident from a 1899 drawing by Picasso entitled Yo El Greco. Of this artistic dependence, in 1912, Paul Fredinand Schmidt commented 'He [Picasso] was a portraitist of tragic significance and it is no accident that a Greco hangs in the same gallery as they share that Spanish sense of isolation, the gloom, the brooding feeling, and a sense of metaphysical with the perfect beauty of their paintings. Even if their means and goals are infinitely diverse: the Greek Spaniard and the Spanish Frenchman 'shake hands across the centuries''. But the intrusion of El Greco onto the consciousness of the European avant-garde was far more complex and begins albeit more randomly in the middle of the 19th century. The first significant advocate for El Greco was the Romantic critic Théophile Gautier, who declared his admiration in Voyage en Espagne (1843), but also claimed that El Greco had gone mad through excessive artistic sensitivity. Although Gautier appreciated El Greco's late work, the idea that he went mad, and that this 'explains' the increasing eccentricity of his paintings, was widely held. In the 18th century, Palomino had written disapprovingly that El Greco \‘tried to change his style with such extravagance that he finally made his painting style worthless and ridiculous'. Even John Charles Robinson, upon giving the National Gallery in London Christ Driving the Traders from the Temple (fig. 9), described it as 'above the average of this most eccentric master's work…at the same time, you know the man was as mad as a hatter'. Reactions to the 'mad' genius of El Greco have always been mixed. His early Byzantine style has only recently begun to be understood and even his Italian works did not always conform to critics' notion of El Greco's genius. Wethey, a significant authority on the artist, described this Entombment using similar language to that of his detractors in the 19th century, writing 'the picture is a caricature of motives drawn from the artist's work'. This parallels the words of Federico de Madrazo, director of the Prado, who in 1881 complained of having to store the 'quite absurd caricatures' by El Greco. El Greco's departure from aesthetic norms had the capacity to disturb his own biographer in 1962 as well as a director of the Prado eighty one years before. It was in Germany as much as in France that El Greco's qualities began to be reappraised. In 1874, the same year as the celebrated exhibition of 'Impressionists' at the studio of the photographer Felix Nadar, a German art historian from Bonn named Carl Justi recognized the first paintings by El Greco in Germany, formerly attributed to Bassano. He would go on to publish Domenico Theodocopoli von Kreta in 1897. Justi, among El Greco's first admirers, was far from a supporter of Modernism and, like many of El Greco's earliest enthusiasts, appreciated that his early works were influenced by Titian and Tintoretto but dismissed his later works as the 'degenerate product of a pathological genius.' Nevertheless, Justi would describe El Greco as 'in fact a prophet of Modernism' and wrote about El Greco's Martyrdom of St Maurice (1580-1582, Escorial) as the 'outrageous music of the future' expressed in the 'crudest contrasts of color, watery blue and sulphuric yellow, in harsh splashes of sunshine and lightning'. However, it was his countryman Julius Meier-Graefe whose enormously influential Spanische Reise (Spanish Journey) carried the torch for El Greco as a proto-modernist. Comparing him to Cezanne, Meier-Graef wrote 'I do not know if even today, Greco would have enjoyed the public reputation in the same way as the recently deceased modernist. Before Cezanne he carried the honorable title of a madman, was as secretive as the other and little familiar with the blessings of public validation; altogether he was so remarkably like our contemporary that one is tempted to take back everything that has been said about the idiosyncrasies of our era, and count the most independent minds of our time as the immediate successors to El Greco…they have the same violence of expression and reduced physicality in the details'. A critical moment for the appreciation of El Greco in this context was the exhibition of the collection of the Hungarian collector Marczell von Nemes at the Alte Pinakotek, Munich in 1911. It included a mixture of eight works by El Greco and contemporary art, and among the many visitors was the young Paul Klee who wrote, 'to point out what is most current, I will join the stream of Pinakotek visitors as they line up to view the works of El Greco…I particularly admire the Laocöon (now Metropolitan Museum of Art, New York) and see in it a puzzle of compositional and painterly perfection'. The following year in the Der Blaue Reiter almanac the Saint John by El Greco (now Museum of Fine Arts, Boston) was illustrated side-by-side with Robert Delaunay's Eiffel Tower, both from the Koehler collection. This conjunction of El Greco and the early 20th century contemporary art movement was eloquently described by Roger Fry, a modernist critic and former curator at the Metropolitan Museum, who described the reactions of the public to the London National Gallery's newly acquired Agony in the Garden of Gethsemane as 'an electric shock…people gather in crowds in front of it, they argue and discuss and lose their tempers…they talk about it as they might talk about some contemporary picture, a thing which they have a right to feel delighted or infuriated by as the case may be – it is not like the most of the old pictures, a thing classified or mummified, set altogether apart from life, an object of vague and listless reverence, but an actual, living thing, expressing something which one has got either to agree or disagree…that the artists are excited – never more so – is no wonder, for here is an old master who is not merely modern but actually appears a good many steps ahead of us, turning back to show us the way.' That way was taken not only by Picasso and Cézanne but also the Blaue Reiter group, German Expressionists such as Max Beckman, even Marcel Duchamp and, in series of drawings explicitly acknowledging his debt, by Jackson Pollock (fig. 11) and less directly by Willem de Kooning. Of the latter Diane Waldman writes, \‘It is however…appropriate to point out de Kooning\’\’\’\’s relationship with El Greco and Chaim Soutine, two other artists who have been characterized as Expressionists…but who do not entirely fit into this tradition...[Their] emphasis upon tactility, motion and light as a dynamic force is evident. El Greco appealed to De Kooning not by virtue of his tortured and twisted figures, but because of his active painting handling and abstract forms\’\’\’\’. De Kooning himself said '[El Greco] is someone else I\’\’\’\’ve always liked. In his paintings material is broken into only a few enormous planes. It\’\’\’\’s so much more interesting to look at than all those intricate creases painted so naturalistically by someone like Tintoretto'. This emotionally charged Entombment, early as it is, exemplifies so many of the qualities which troubled El Greco's critics and enthralled his admirers. Imagined with little regard for the conventions of spatial perspective and Renaissance idealization in the drawing of face or body, the artist achieves, on a tiny scale, a vision of remarkable dramatic intensity: the complex knot of protagonists, rendered in vivid strokes of blues, green, carmines, pinks, greys and white. In this scene of restless movement enlivened with flickering accents of light, the action pushed forcefully to the very front of the picture plane, El Greco, though mindful of his sources, has already established himself as an independent master in every sense. 26 3/4 by 22 in. ; 68 by 56 cm. 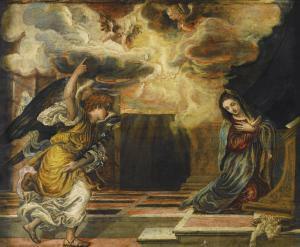 Sale: Bonham's, London, 5 December, 2012, lot 78 (as "Attributed to El Greco" of Saint Peter). 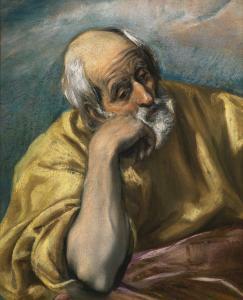 Toledo, Museo de Santa Cruz, El Greco: arte y oficio, 9 September- 9 December, 2014, cat. 11. L. Ruiz Gómez, "Un san José inédito del Greco y la reconstrucción de una Sagrada Familia perdida," in Ars Magazine, 7, number 22, April-June 2014, pp. 65-71, English translation pp. 149-151, reproduced. Unknown to scholars until its recent reappearance a few years ago, this Saint Joseph has now been recognized as a fully autograph work by El Greco, dating to his first years in Toledo, newly arrived from Rome, a moment of particular artistic creativity and energy for the artist. The strong and confident modeling of the figure, the undulating and convoluted drapery, and the rough and free handling of paint find parallels in some of El Greco\’\’s greatest and most famous masterpieces of the late 1570s, including the Espolio in the Toledo Cathedral, the Vision of Saint Lawrence in the Colegio de Nuestra Señora de la Antigua, Monforte de Lemos, and the Saint Sebastian in the Palencia Cathedral. Unlike many of El Greco\’\’s compositions, the Saint Joseph was not widely repeated by the artist or his studio, and represents a testimony to a hitherto unknown composition, even rarer in that it is solely by the master himself. Thus, its recent inclusion in an exhibition in Toledo celebrating the 400th anniversary of the artist\’\’s death has allowed one of the most unique works from a crucial moment in the development of El Greco\’\’s career to be rediscovered. The early history of the Saint Joseph is unknown, although it appears to have been for most of the last century in a French private collection as a depiction of Saint Peter, although with a traditional attribution to El Greco. The paint layer of the painting has survived very well, as a recent restoration has revealed (see fig. 1), and with its rediscovery, a fuller and in depth examination of the painting has become possible. Leticia Ruiz Gómez has studied the present canvas first hand, and has presented a full and compelling study of the picture (see Literature). The painting itself presents the saint in a pensive attitude, his head listing to the left, resting on the fisted hand of his right arm. El Greco endows the figure with a strong sense of corporality, and Joseph\’\’s face and beard are slightly pushed aside by the weight and strength of his pose. To add to this illusion, the artist has even suggested a few errant wisps of grey hair trapped against the saint\’\’ s knuckles, painted with just a few flicks of white and black paint. The arm itself, which runs downward to just left of the center of the composition, is particularly beautifully rendered, not in the free and painterly style of much of the rest of the canvas, but in a carefully modeled, smoother finish (\“con una factura suelta que combina las pinceladas gruesas y directas del mano con los arrastres que modulan volumetricamente el brazo o los toques a punta de pincel aplicados de manera pormenorizada y decisiva\” ). Such solidity of form, which fades away in the artist\’\’s later works, appears to have been a holdover from his sojourn in Rome, and is comparable to other figures that he painted at the same time such as the brawny carpenter at the lower right of the Espolio, or indeed that of Christ himself in the Holy Trinity (Museo del Prado, inv. P00824). The Saint Joseph is painted on a warm ground layer, of an orange pink, over which was applied in a \“brushy\” manner a layer of rich blue, outlining the figure. This is a technique typical of this moment in El Greco\’\’s career. Another interesting technical fact, which only became apparent after examination, is the type of cloth on which the Saint Joseph is made; it is a canvas woven with a pattern of intertwined rhombuses, and is seen in another El Greco painting of this moment, the San Benito (Museo del Prado, Madrid, inv. P00817), painted as part of the altar for the Church of Santo Domingo el Antiguo, Toledo, in 1577-79. Theories about the Saint Joseph have been proposed to place it within the corpus of El Greco\’\’s works and to understand more fully the artist\’\’s intention when he created the work. Ruiz has noted the pictures relationship to a painting of the Holy Family with Saint John the Baptist known only through a black and white photograph conserved in the archive of the Prado Museum (see fig 2). That painting is clearly by a follower of the artist, or conceivably is a weak studio work; what is striking, however, is that the figure of Saint Joseph in the upper left of the composition replicates the pose in the present canvas. This has lead to some speculation that the present canvas is a fragment from a much larger canvas of the Holy Family, perhaps corresponding to the composition known only in the photograph. An x-ray of the present canvas brings this assertion into question, however (see fig. 3). Study of the film shows broadly and freely applied brushstrokes outlining the contours of Saint Joseph and his drapery, but no evidence of the figure of the young Baptist whose head would have been placed in the center of Saint Joseph's chest. Nor does the drapery in that area look in anyway added or altered at a later date. Ruiz posits that El Greco may have found inspiration for a larger Holy Family from Paolo Veronese\’\’s altarpiece of circa 1551-55 of the Holy Family with Saints Catherine and Anthony Abbot , San Francesco della Vigna, Venice. In that composition, Saint Joseph is similarly shown with his head resting on his hand, but with his left, not right one. She notes that in that composition the Infant Baptist is to the left, but this would lead the composition much further away from that preserved in the black and white photograph. Another possibility is that this Saint Joseph may have been a fully worked up sketch for a now lost autograph Holy Family, much along the lines of the composition mentioned earlier. The position of Saint Joseph at the extreme left of the picture plane has parallels in other works by El Greco, such as the Holy Family with Mary Magdalen in the Cleveland Museum of Art (inv. 1926.247). Although that picture dates later than the present canvas, it too shows Saint Joseph relegated to the far left, forced to lean in to hold out a bowl of fruit. Ruiz also finds parallel with another altarpiece in which Saint Joseph is similarly isolated, the Holy Family with Saints Ildefonso, John the Evangelist and a donor figure of 1589 by Blas de Prado, who was active in Toledo at the same moment as El Greco. In that painting, Saint Joseph is shown half length behind a stone bench, also leaning on his right arm and draped in a yellow mantle. The motif of the \“pensive\” Joseph may have derived from a drawing of Albrecht Dürer of the Holy Family (Kupferstichkabinett, Berlin, inv. KdZ 4174), although how El Greco would have had access to that is unclear. 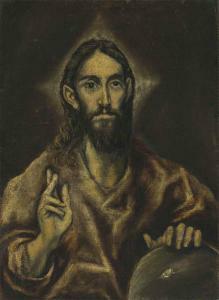 Whatever its source, it could be that El Greco was working the idea up to use in a different composition. El Greco was a careful artist and very willing to adapt his ideas and use them more than once; indeed, the exact pose of the Madonna and Child which appears in the London Holy Family is employed by the artist in reduced size in the Vision of Saint Lawrence of circa 1578-81. This connection to that painting further strengthens Ruiz Gómez\’\’s argument that this Saint Joseph should be dated to 1577-80, at the same time as these other well-known paintings by the Master. 2 See L. Ruiz Gómez, El Greco Painter and Master, p. 33. 3 The photograph was sent for an opinion by an English collector to the Prado in 1957, though no record of the response made at the time is extant. 25 by 30 in. ; 63 by 76 cm.